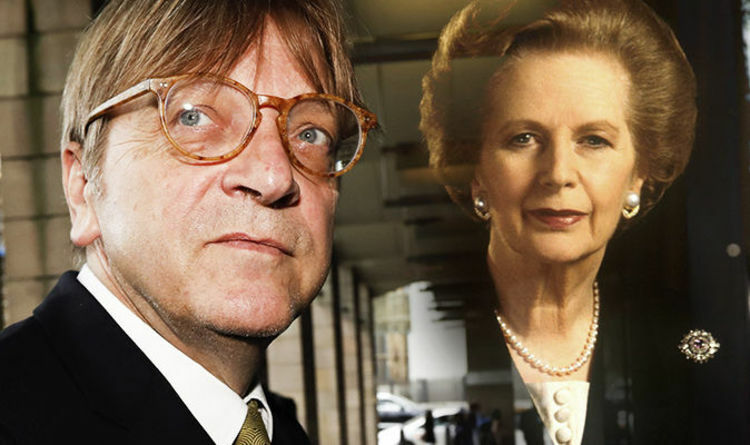 The leader of the Alliance of Liberals and Democrats for Europe, and a Member of the European Parliament from Belgium since 2009, quoted Mrs Thatcher to paint her in a seemingly pro-EU light. He tweeted: “30 years ago Thatcher said ‘Britain doesn’t dream a cosy, isolated existence on the fringes of the European Community. Our destiny is in Europe as part of the Community’. But Foreign policy analyst and former aide to Margaret Thatcher, Nile Gardiner, reprimanded the Belgian politician and reminded him that Mrs Thatcher was a staunch eurosceptic. He replied on Twitter: “Margaret Thatcher believed firmly that Britain should leave the EU and would have wholeheartedly backed Brexit. “She declared that the European Project was the greatest folly of the modern era. The spat comes after the 30-year anniversary of Margaret Thatcher’s infamous Bruges Speech. This was the moment she officially denounced the EU and provided an inspiration for a generation of eurosceptics. In fact, the speech inspired the anti-EU think-tank the Bruges Group – forerunner to the UK Independence Party. Mrs Thatcher gave an uncompromising speech laying out her vision for the European Community – which would later become the EU – and urged against measures which could “suppress nationhood” and ultimately lead to a European superstate. Faced with what she saw as a power grab by the then European Commission chief, Jacques Delors, Mrs Thatcher intervened in an bid to keep the European project on track and outlined a series of guiding principles which she hoped would “chart the way ahead”. Three decades later, important lessons can still be learned from the seminal speech and are especially relevant as the remaining EU27 engage in a major debate over which direction Europe should take next, the Austrian Economics Center (AEC) said. But despite being viewed by some as an attempt to push the Britain towards the exit, Mrs Thatcher’s speech was actually delivered to keep the European project alive, the think tank said. Mrs Thatcher was originally a staunch pro-EU – then called the Common Market – in the original 1975 referendum and campaigned vigorously to keep the UK in it. She is also credited as being one of the architects of the single market in the 1980s.